Notice that it has a clip without a rolling ball. It also has a blind cap. As you can see of course, it lacks the nib--and who knows what else. That'll be the first thing I look for. Anyone help me out here? I'd be grateful for any information. Edited by Robert111, 18 February 2013 - 00:52. If I were you, I'd head over to Pensbury Manor, Syd Saperstein's Wahl-Eversharp site. He's probably the top authority on these pens, and by looking around you can probably ID the pen. Drop him a line with questions about getting a nib, etc. As a complete coincidence, I had a great chat with him on Friday afternoon at the LA Pen Show. Learned a boatload of stuff about the company's history, and all the pens, and saw all their newly-introduced pens - the are *fabulous*! One thing he mentioned was phlorescence (not sure of the spelling) which would occur with some of the W-E plastics. They become more transparent and almost seem to glow... when the plastic is starting to break down. The top of the cap on your pen may be exhibiting that, so just handle with care. I'll try Syd then. Thank you, and best of luck to you. 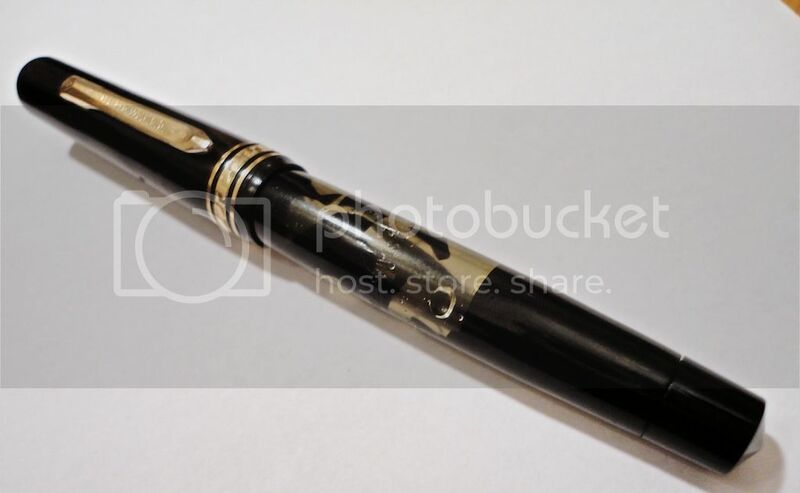 This is a Depression Era Equipoised pen, called "Round Vacuum Model" in Eversharp catalogues and sold along with the Airliner Dorics between 1935-1939. 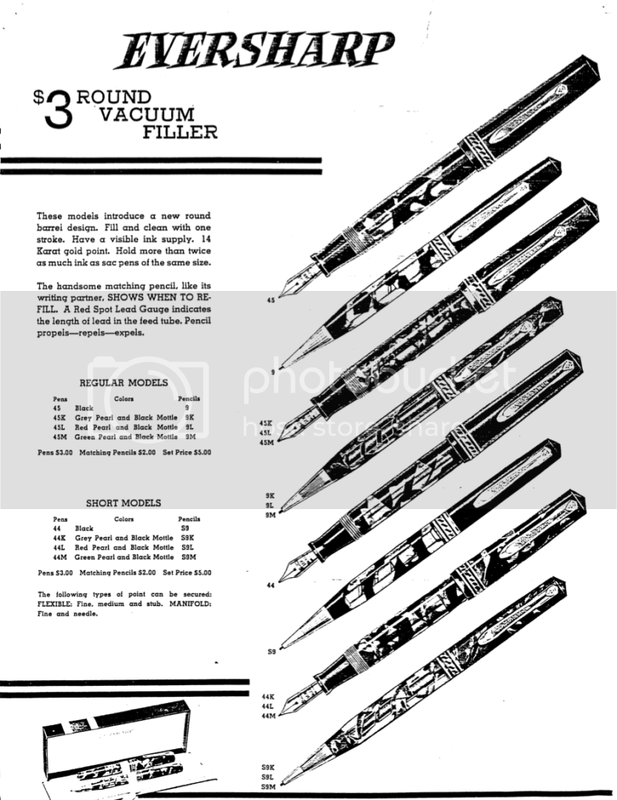 The Deco Band is a carry-over from the earlier pens produced between 1930-34 but the "Round Vacuum Models" a.k.a. Depression Era Equipoiseds were also known to be available with three narrow bands to the cap lip. The filling system is not a button filler but rather the plunger-vac system aka One-Shot Vacuum Filler - same as in the Vacuum-Fill Airliner Dorics and similar to that in the Sheaffer Vac-Fil Balances from the mid 30s. These are quite tricky to repair so even though the model has been identified, you will still want to speak to Syd about the restoration/repair. Edited by ihimlen, 18 February 2013 - 13:28. SOme people have called thee pens "Round Dorics" (not). They were later vacuum fillers that were made in or around 1938-9. They usually have 3 gold cap rings. Looks to me as if someone has replaced the original cap with an equipoised cap. Edited by Robert111, 18 February 2013 - 14:21. Robert, it all depends which catalogue you consult. I'm guessing Syd just checked the 1938-39 catalogue which features only the pens with three narrow bands. 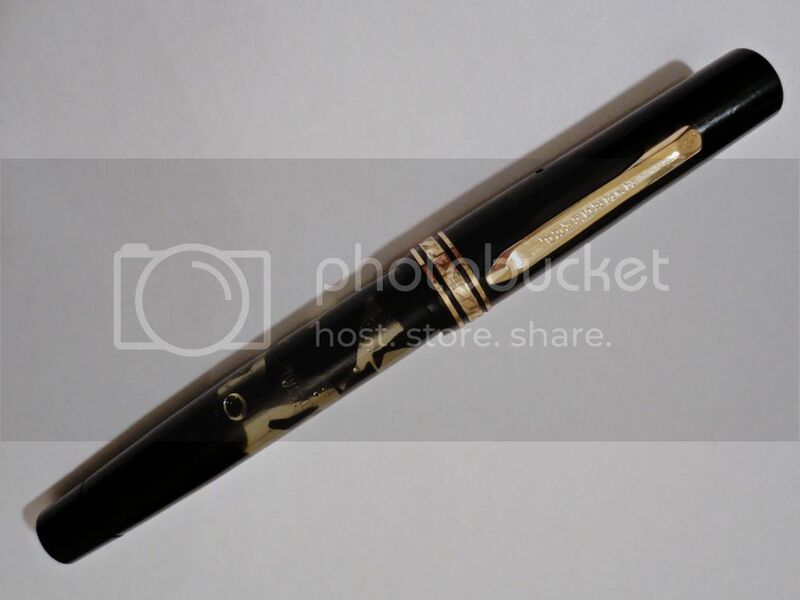 The Equipoised-style (Deco Band) pens were offered earlier and they were discontinued by 1938. Between 1935 and then Wahl likely decided to use up all the 'old style' Equipoised bands they had left over on a newer type model with a newer type clip. These pens were slightly cheaper than the flagship Gold Seal Airliner Dorics but somehow they are tough to come by. I had two of these Deco Band models - one in green (just like yours) and one in black - both with transparent barrel (yours should clean up nicely though it'll likely be a bit ambered. The pics below show what these pens looked like when new). These pens often have really sweet flex nibs. Edited by ihimlen, 18 February 2013 - 20:41. Thanks again Ihimlen. That's certainly is helpful and interesting. 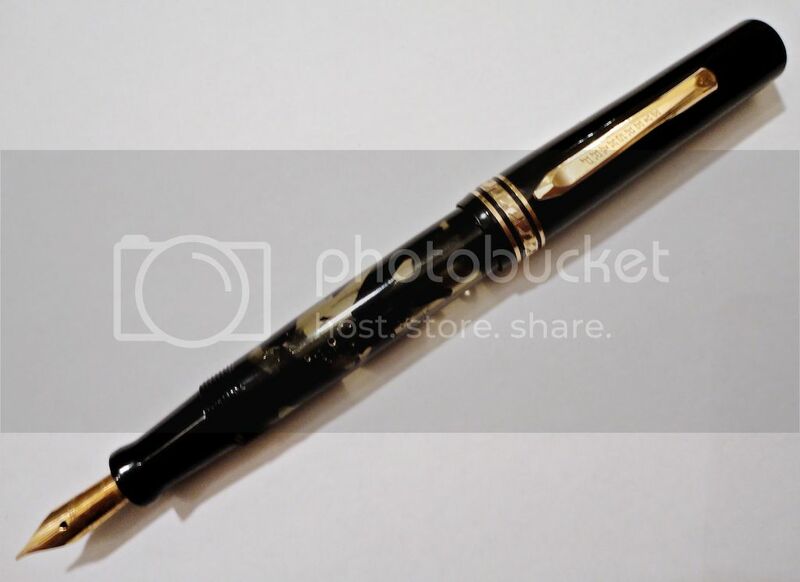 Your pen is beautiful and I see the nib has the heart-shaped breather. Can you tell me what's inscribed on the nib? YES! ihimlen is correct. I replied casually from my hotel room at the LA Pen show late the other night with no catalog to refer to. SO I am glad to stand corrected on the Equipoised cap band issue...forgot about that. Ah, the value of a knowledgeable committee. Multiple heads are better than one for sure. Syd, I actually suspected you were at the Show so I thought I'd chime in - it's always useful to have some catalogues, ads & Wahl literature to hand - (especially with the more obscure models) and it's usually impossible to take these with you when on the go. I have exactly the same problem when I'm at work, with no access to the Wahl literature. Robert, the nib is marked EVERSHARP (in a rainbow-like banner) and underneath that "Manifold" and the usual "14k Made in U.S.A." So this is a firm nib, but I also had a green 1935 Equipoised (actually with a pencil to go with it) and that one has a lovely flex nib. I'll try to dig up some photos this evening. Thanks to you both once again. I'm new to this forum but I know I'll be back because this is just such an adventure. 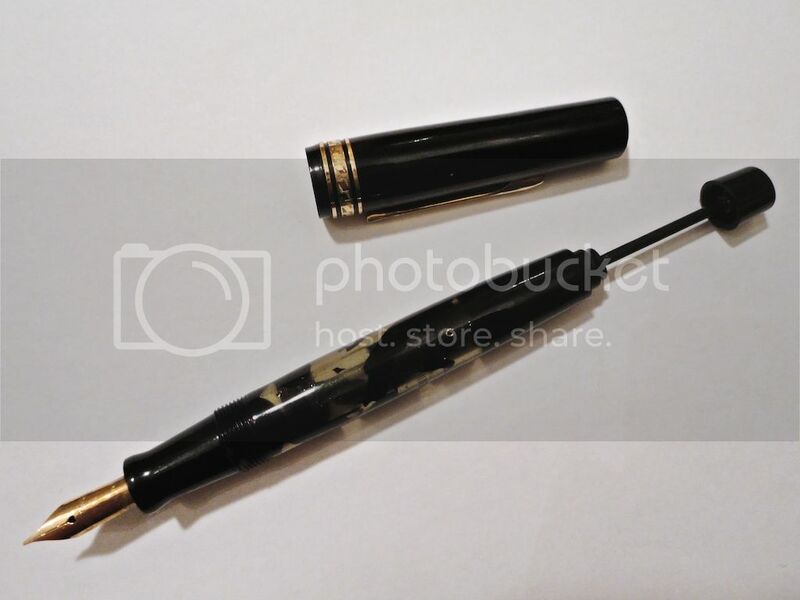 Buy an old pen on eBay, find out if it's correct, and start looking for parts. I'm hoping, ihimlen, to get a flex nib for this pen so I'm looking forward to hearing what's on the Equipoised. Meanwhile I'm looking forward to getting this odd ball and digging into it.